The ultimate integration for digital system cars. iPod car adapter, iPhone car adapter and bluetooth car kit. iPod in car. Play iPod and USB music devices through the car radio, using the car radio controls to browse and select items from your device. Gateway 500 is a digital device, using fibre optic connections, which works with cars which use the MOST (Media Oriented System Transport) digital system to carry entertainment information arSound the car. These cars are predominantly the higher specification models of Audi, BMW, Mercedes and Porsche, plus some Aston Martin, Saab and Volvo models. Click on your car make to see if it is compatible. Once the Gateway 500 is installed, you can connect your iPod or USB and display it’s content on your vehicle screen. By adding the optional BTA 1500 module, your phone can be integrated, and with the AVR, you can control video input around different screens in the car, including iPod video. There are no extra boxes to stick on the dashboard, or unsightly cables trailing around the vehicle. The interior of your car looks exactly like it did the day you bought it, it just does a lot more. Gateway 500 works like an adapter between your devices and the car, converting instructions from the car’s controls e.g. BMW iDrive or Audi MMi rotary controller, into a language that your phone or iPod can understand and respond to. When connected into the car, Gateway 500 emulates a CD changer, but has a switch which allows you to swap between the Gateway and the changer. 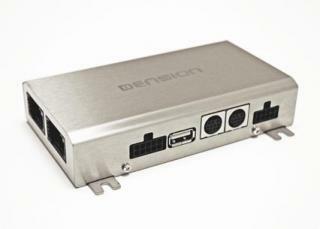 Of course, every Dension Gateway 500 car adapter comes with a comprehensive user manual, but in most cases, you select the CD changer function, then CD6, and a series of menus are opened up to you to control your devices. The system controller in the car is then all you need to navigate around your devices. Gateway 500 will also send all this information to the display in your car, usually a screen, so you can always see exactly where you are, what’s playing, or who’s calling you. There are a few MOST audio systems which do not support text from the iPod, and for these we would recommend using a Gateway Lite. For a list of these vehicles and details of the product, click here. To download a user manual for your vehicle, click here.